Finger-knitting is an easy way to get children involved in knitting because it doesn't require as much coordination as knitting on needles. It also makes a quick and portable project for adults that can be completed before your favorite television program ends. Experiment with bulky or super-bulky yarns to create a narrow scarf or belt with no tools except your own hands. Make a single finger-knit strand for a skinny scarf, or make multiple strands in complementary colors and twist or braid them together for a wider, bulkier scarf. 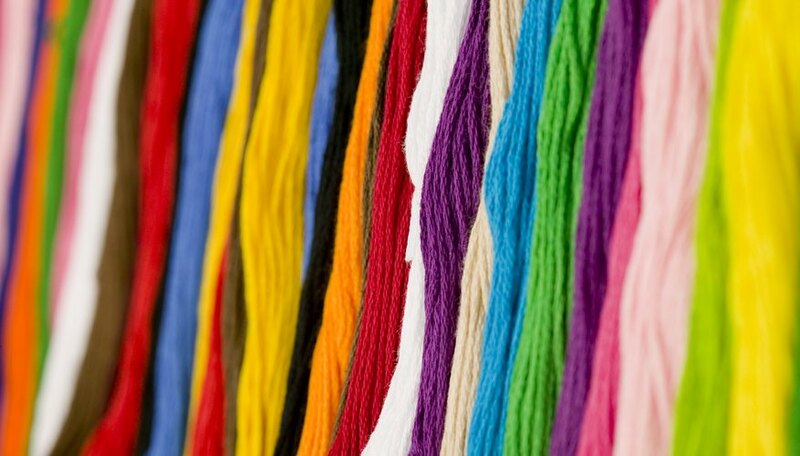 Select a bulky or super-bulky yarn. These are labeled with a number 5 or 6, according to the Craft Yarn Council's standard yarn weight labeling system. If you don't have a bulky yarn available, use two strands of worsted-weight yarn held together. Hold your left hand palm up and grasp the yarn between your thumb and the side of your index finger. Wrap the yarn behind your index finger and all the way around the finger to the back of your hand. Continue looping the yarn around your middle, ring and pinky fingers. Grasp the yarn hanging from your pinky finger and drape it across all four fingers, with the loose end hanging between your index finger and thumb. Lift the loop from the base of your pinky finger over the new strand of yarn and off the end of your finger. Repeat with the loops on each finger. You now have one row of finger-knitting on the back of your hand. Wrap the yarn hanging near your index finger across the front of your fingers, and then repeat the process of lifting each loop over the new strand and over the back of your fingers. Continue to drape the strand of yarn across your fingers and pull the loops over it for each row until your scarf reaches the desired length. Cut the yarn, leaving a tail of at least 6 inches. Remove the loops from your fingers and thread the yarn tail through each stitch. Knot the yarn to prevent the stitches from unraveling. Use a yarn needle to weave in the loose ends of the yarn into the scarf. Braid together three finger-knit strands to create a wider scarf. Sew the three strands together at the top and bottom with yarn and a yarn needle to prevent the scarf from unraveling. If your knitting is interrupted, transfer the loops from your fingers to a pen, pencil or knitting needle to save your work for later. Supervise children as they are learning to finger-knit to make sure they do not wrap the yarn too tightly around their fingers.